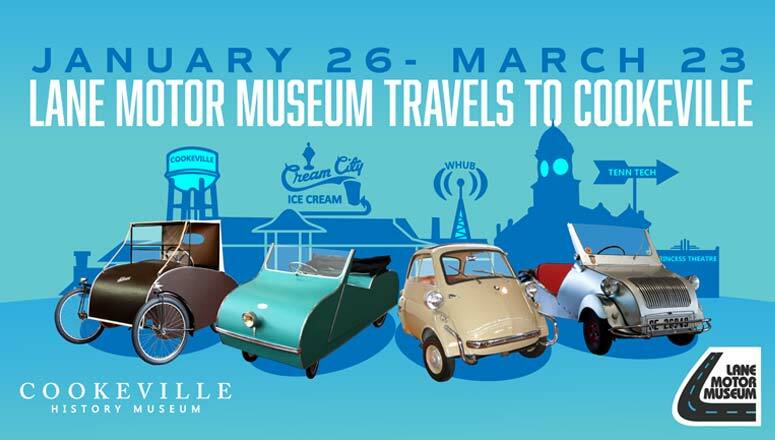 COOKEVILLE - An exhibit of tiny cars is expected to generate big excitement at the Cookeville History Museum. The exhibit, part of a collection from Lane Motor Museum in Nashville, will feature six microcars. And, yes – all of them will fit inside the history museum. The exhibit – “Lane Motor Museum Travels to Cookeville” – opens Jan. 26 and, weather permitting, will feature a Cars and Coffee car show from 9-11 a.m. in the parking lot at the corner of Broad and Fleming Streets, across from the Cookeville Fire Department. Five of the six cars in the microcars exhibit are still drivable. The smallest car to be displayed is a 1976 Willam Cyclo from France. Boxy and bright yellow, it measures six feet long by just under three feet wide. The largest is a 1957 BMW Isetta 300 from Germany, measuring seven and a half feet long by four and a half feet wide. Its single door opens from the front, allowing two passengers to step inside. “We selected a few small cars with small engines made in Europe, plus one from the U.S., after World War II,” said Bennett, who lives in Cookeville and also serves a Cookeville History Museum volunteer and Friends of the History Museum board member. He noted that even Elvis Presley owned the famous Isetta, a microcar that helped BMW get back on its feet after World War II. “With Europe’s economy in shambles, auto manufacturers knew they needed to get people back on the road,” Bennett said. “Fiberglass was a new and easy way to make car bodies, so many companies simply put small, scooter-like engines into these very tiny and inexpensive cars, and the microcar was born. The exhibit’s lone American microcar is a 1942 Carter Town Shopper, one of a few U.S. cars built during World War II. It was marketed mainly to women as a low-cost, two-seater errand runner – a car that could “ease the burden of home life while the husband was overseas,” according to the Lane Motor Museum website. “As we like to say at Lane Motor Museum, there are so many different ways to build a car, and microcars were a unique car built for a certain time and place,” Bennett said. The exhibit continues through March 23 at the Cookeville History Museum, 40 E. Broad St., Cookeville, TN. Admission is free and the museum is open Tuesday-Saturday from 10 am- 4 pm. For more information, call 931-520-5455.